Adam Rooney's first-half penalty earned Aberdeen a seventh win out of seven as they moved five points clear of Celtic at the top of the Scottish Premiership with victory over Hamilton Academical. The goal came after Kenny McLean had put Graeme Shinnie clear and the left-back was fouled by Ziggy Gordon. Rooney converted confidently and later had a header saved. The Dons were reduced to 10 men for the final few minutes after Ash Taylor went off with a cut eye. But they held on to extend their best ever start to a league campaign. Expectancy was high among home fans as they looked for their side to build upon on Saturday's 2-1 win over Celtic. They started slowly but eventually began to pin their visitors back without suggesting they would overpower them. There was a soft claim for a penalty when Rooney's mishit shot struck Jesus Garcia Tena's hand but the appeal was waved away. The first real threat from the hosts came when the ball sailed across the park to Niall McGinn, who beat his man but watched as his cut-back was diverted for a corner. The winger threatened again when he curled the ball towards Northern Ireland team-mate Michael McGovern's left and, despite the keeper stepping the wrong way, he got back to palm clear. From the resulting corner, Rooney flicked a header towards goal but it sailed a few yards past the far post. The breakthrough arrived when Gordon took out Shinnie in the box and Rooney firmly slotted the penalty low into the net. Fans expected the home side to build on that but Hamilton kept their shape in the hope of creating something to draw level. Antons Kurakins broke on the left and his centre reached Dougie Imrie, who went down, but referee Crawford Allan booked the midfielder for simulation. Rooney and Grant Gillespie had efforts at either end but the chances were becoming less frequent. A second Aberdeen goal seemed certain when nice work between Shinnie and Ryan Jack ended with a lovely cross, which Rooney met with a close-range header, but McGovern produced a fabulous instinctive stop to keep his side in the game. Jonny Hayes then got on the end of a one-two and protested for a penalty, claiming Gillespie had handled, but the referee disagreed. 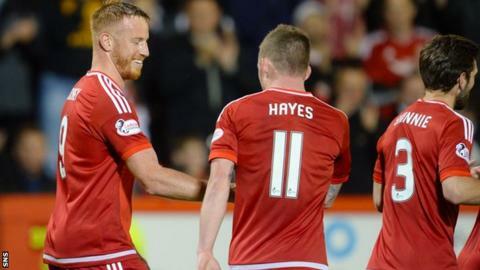 Hamilton were capable of stealing an equaliser as Aberdeen failed to pressurise the visitors. Gramoz Kurtaj thought he had delivered with a drive across goal and that warning left the crowd a little more wary of being just one ahead. McGinn almost sealed it when he gathered outside the box and watched his deflected shot beat McGovern and crack the frame of the goal. Then substitute Josh Parker should have added a second when he raced clear only to let Hamilton recover. It was nervy as the game became stretched and Hamilton really pushed on but it is the mark of a successful side that when not quite at their best, they can see it out and take three points. Aberdeen managed that. Match ends, Aberdeen 1, Hamilton Academical 0. Second Half ends, Aberdeen 1, Hamilton Academical 0. Substitution, Hamilton Academical. Louis Longridge replaces Ziggy Gordon. Josh Parker (Aberdeen) wins a free kick in the defensive half. Jesus Garcia Tena (Hamilton Academical) wins a free kick in the attacking half. Foul by Josh Parker (Aberdeen). Attempt saved. Gramoz Kurtaj (Hamilton Academical) right footed shot from outside the box is saved in the centre of the goal. Corner, Aberdeen. Conceded by Michael McGovern. Substitution, Aberdeen. Peter Pawlett replaces Kenny McLean. Attempt missed. Shaleum Logan (Aberdeen) left footed shot from outside the box is close, but misses to the right. Attempt saved. Niall McGinn (Aberdeen) right footed shot from the centre of the box is saved in the top centre of the goal. Alejandro D'Acol (Hamilton Academical) wins a free kick in the defensive half. Attempt missed. Kenny McLean (Aberdeen) right footed shot from outside the box is close, but misses to the left. Substitution, Aberdeen. Shaleum Logan replaces Ryan McLaughlin. Substitution, Aberdeen. Josh Parker replaces Jonny Hayes. Adam Rooney (Aberdeen) wins a free kick in the attacking half. Grant Gillespie (Hamilton Academical) wins a free kick in the attacking half. Adam Rooney (Aberdeen) wins a free kick on the left wing. Jonny Hayes (Aberdeen) wins a free kick in the attacking half. Attempt saved. Lucas (Hamilton Academical) header from the centre of the box is saved in the centre of the goal. Attempt saved. Gramoz Kurtaj (Hamilton Academical) right footed shot from the left side of the box is saved in the bottom left corner. Willo Flood (Aberdeen) wins a free kick in the attacking half. Substitution, Hamilton Academical. Alejandro D'Acol replaces Christian Nade.